In 2088, humankind is at last ready to explore beyond Earth's solar system. But one uncertainty remains: Where do we go? Astrophysicist Reggie Straifer has an idea. He's discovered an anomalous star that appears to defy the laws of physics, and proposes the creation of a deep-space mission to find out whether the star is a weird natural phenomenon, or something more alien.The journey will take eons. In order to maintain the genetic talent of the original crew, humankind's greatest ambition--to explore the furthest reaches of the galaxy--is undertaken by clones. But a clone is not a perfect copy, and each new generation has its own quirks, desires, and neuroses. As the centuries fly by, the society living aboard the nine ships changes and evolves, but their mission remains the same: to reach Reggie's mysterious star and explore its origins . 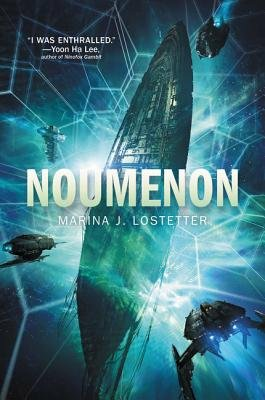 . . and implications.A mosaic novel of discovery, Noumenon--in a series of vignettes--examines the dedication, adventure, growth, and fear of having your entire world consist of nine ships in the vacuum of space. The men and women, and even the artificial intelligence, must learn to work and live together in harmony, as their original DNA is continuously replicated and they are born again and again into a thousand new lives. With the stars as their home and the unknown their destination, they are on a voyage of many lifetimes--an odyssey to understand what lies beyond the limits of human knowledge and imagination.